Every now and again this needs saying again. We’ve been saying it for years, and most recently since this site was launched we’ve said it, again and again. Paper “wealth” is an illusion, and it”s unraveling fast.. But those are old posts now, and don’t get seen as much as time passes, so let’s re-state our opinion on why you need to buy gold now, and let’s use the words of someone far more qualified and eloquently written, one of our favourite commentators Larry Edelson from http://www.uncommonwisdomdaily.com. ..over to Larry. And now, many are still in denial, claiming that it’s peaked and destined to lose 20% … 30% … even 50% of its value. They’re referring to gold. And each and every time I’ve heard the pundits talk about gold, they’ve been dead wrong. Suddenly and inexplicably, the skeptics are gone. Suddenly, everyone is starting to talk about gold again. Only this time, they’re believers. This time, they say, the strength in gold is different from past gold rallies. On that score, they’re right — darn right: The rally you’re witnessing … the one successive record high after another in gold — is not only real, it’s destined to continue. My forecast: Despite a pullback here and there — like the one occurring now — gold is headed at least $1,000 higher, to more than $2,300 per ounce. And probably, in the end, even higher than that. What’s more is that it will likely happen within a timeframe that could come a lot sooner than anyone now dreams possible. For the last 5,000 years, the yellow metal has been propelled higher and protected investors for similar reasons gold is rising today. In Rome, they devalued the denarius by removing its gold and replacing it with silver. Then they removed the silver and replaced their currency with slugs of copper. In Byzantium, the gold Bezant was also watered down over time, eventually, like the denarius, becoming an obsolete currency as well. In civilization after civilization, currencies have been devalued by a host of means — all of them giving birth to new bull markets in gold which protected investors, time after time. #1. Paper money is being systematically devalued by central bankers and politicians, especially in the U.S. and Europe. #2. The private sector and investors are losing confidence in governments all over the world. #3. Geopolitical tension and civil strife is more prevalent than it has been in at least the last 40 years. #4. The wild, out-of-control spending and debt accumulating that’s ingrained in today’s culture, especially in the U.S. and Europe. And all of this is occurring as global gold production continues to dwindle in some regions of the world. Example: South Africa where gold production is now at its lowest level in 86 years. For the last 5,000 years, gold has propelled higher and protected investors. Strange bedfellows you might think. But not really. Moscow was reeling under an estimated $150 billion worth of publicly issued IOUs, debt they had accumulated when the Berlin Wall fell and the former Soviet Republic turned into a splintered group of free-market Russian states. The debt, mostly issued with the intent of building infrastructure for the new Russia, was for the good of the region’s new 146 million capitalists. However, corruption at so many levels in the government resulted in waste and bureaucratic nightmares. Projects either never got off the ground or ended up lining the pockets of the oligarchs who effectively printed their own money with assets previously owned by the state. End result: The sovereign debts of the new Russia quickly went bad, and for the next five years Russia collapsed into turmoil. Though almost a world away, it wasn’t much different in Thailand. The country’s economy was cooking in the earlier part of the 1990s. Gross domestic product was jumping at an average rate of 9% a year. So the country borrowed money, lots of it, to expand even more. Public officials and those quickly getting wealthy in Bangkok were all thinking the same way. In fact, so much money came into Thailand that the Thai baht was strengthening quickly in local markets. Yet it remained tied to the dollar, which at the time was also rising in value. So with a currency too strong, the economy suddenly became uncompetitive in the region. Billions of dollars borrowed … billions promised by the government to the country’s citizens … and yet billions more bet on the future were all suddenly at risk. The economy started to collapse. The only option for authorities and regulators: Bust the Thai baht loose from the dollar and let it float freely on foreign exchange markets. The thinking: Give the system some flexibility and let market forces take over. It was the only choice the authorities really had at the time. But what they didn’t realize is that confidence in the government had already been lost. Investors felt insecure about debt issued by the government. End result: The baht collapsed, soaring from 28 to the dollar to 58 OVERNIGHT. Capital stampeded out of Thailand like there was no tomorrow. The economy collapsed, shrinking almost 50% in no time at all. Bonds and other debt offerings went bust. Gold soared in local prices, just like it did in rubles for the former Soviet Union. Moscow and Bangkok … strange bedfellows no doubt … totally unrelated at first glance. But in both cases, simmering below the surface, were excessive debt levels going bad. Paper assets went up in smoke. And investors got burned. Big time. Except for those who owned gold. The Nasdaq hit 5,132 in March 2000, up 1,489% from its low of 322.93 in October 1990. Dotcoms were everywhere, all the rage. Investors couldn’t care less about brick and mortar companies with real assets, with real three-dimensional products for sale. All they wanted to know was how many eyeballs are looking at a web page at any given moment. All they wanted to know was how many clicks a link on a website got. And all they wanted to know was the latest dollar figure being assigned to such numbers. They multiplied them out and got the stock price. Forecasts kept getting raised and share prices kept going up. But suddenly reality set in and investors took a breather. They thought about what they were doing. They woke up and smelled the coffee, prodded no doubt by disasters such as Enron and WorldCom. They started to ask themselves what the heck they were really buying. And voila! The paper assets suddenly collapsed virtually overnight, in the worst stock market crash since the Great Depression. Paper, in the form of stock certificates, crumbled in value. But not gold. It started exploding higher, and since then, hasn’t taken more than an occasional breather, pulling back but consolidating to make a run to one new high after another. The Time: 2006 The Place: All Over the U.S. The problem: Subprime mortgages. As much as $400 billion in debt, issued to anyone who breathed, is now in danger of going up in smoke as the underlying collateral, real estate prices, tanks. 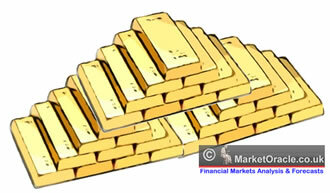 Each time the stock market has crashed, gold has exploded higher, providing a safe haven for investors. It’s not so much that real estate prices are falling. It’s that too big a debt pyramid has been built upon an otherwise solid asset, real estate.Now, the foundation is weak … not the property, but the borrowers. As in the historical examples I just gave you, investors similarly saw debts in the private sector evaporate into thin air. Paper assets and debt, gone bad once again. Meanwhile, the U.S. dollar, once the most respected currency in the world, began falling in value virtually non-stop. #1. Paper money systematically devalued by the U.S. central bank — in an attempt to inflate away the debt crisis in the real estate sector. #2. While the private sector and investors started losing confidence in Washington, and Wall Street. #3. Causing civil strife, a tea party revolution, and massive anger at the upper classes and politicians. The debt crisis in the private sector has migrated to the public sector. Greece is broke. So is Portugal … Spain … and Italy. Europe is now buried under so much bad debt, the euro is crashing. And guess what? The normally-conservative European Central Bank is now even printing money like mad. With no end in sight to how much fiat currency it will print — and each and every one of the dollars printed adding to an unlimited supply of monopoly money. Is it any wonder that gold has just hit new record highs? Is it any wonder that gold is now being rediscovered as the hard currency it has always been? I don’t think so. Not in the least. Before it heads a lot higher! The gold you buy today can be sold off at a higher rate in the future.